Hazen Pingree was a very highly regarded civic leader in Michigan at the end of the Nineteenth Century. He was best known—locally and nationally—for his accomplishments as mayor of Detroit. Sparsely populated villages became cities in the late Nineteenth Century, especially as manufacturing industries emerged following the Civil War. Detroit’s population went from 21,000 in 1850 to 286,000 in 1900. For the first time, municipal governments began to deal with many costly issues that hardly arose when villages had just a few thousand residents: policing, modern firefighting, huge water and sewage systems, roads and public transit including both horse drawn and electric street car lines. City governments also got involved with granting many licenses, permits and zoning approvals for profit oriented firms. Many successful businessmen assumed they had civic responsibilities so they often served as mayors or city officials. After 1880, large number of immigrants arrived in cities both from abroad and from rural parts of the United States, drawn to cities by the great growth of manufacturing jobs. Gradually, political parties began to organize blocks of voters and career politicians emerged after about 1900 to govern most cities. But in the later Nineteenth Century, it was typically businessmen who served as mayors and civic leaders. In many cities, including Detroit, citizens often believed that the businessmen who ran the city’s government practiced a type of “crony capitalism” in which lucrative city contracts and licenses to provide services such as street cars went to the friends of the mayor or to firms in which the mayor and his friends held a financial interest. Reformers saw these mayors as benevolent civic officials with the benefits flowing most directly to the leaders of the city’s biggest firms. Critics argued that rate payers were seeing their taxes spent to support the friends and businesse of the business elite that ran the city. Here is where Hazen Pingree enters the picture. He was born in Denmark, Maine in 1840. His family moved to Saco, Maine on the Atlantic Coast and he completed his basic education there. At age 16, he moved to Hopkinton, Massachusetts where he learned the cobbling trade. In 1862, Pingree joined the Union Army and served for the duration of the Civil War. Even though he was held in Confederate prison camps for quite some time, he escaped and served with former Detroit resident General Ulysses S. Grant at Appomattox. After the War, he decided he would seek opportunities in Detroit. He originally worked a number of jobs but, after some time, went to work for a local shoe firm. At this time, there were no national chains making and distributing shoes across the country. Every village and town had its own shoe producers. Hazen Pingree and his partner, Charles Smith, developed a large and prosperous firm: the Pingree and Smith Shoe Company. It went through a series of financial changes and reincarnations but grew, and by 1890, it may have been the largest shoe manufacturer in the Midwest. Similar to many other prosperous businessmen, Pingree entered politics, but he was a reformer. He presumed there was much inappropriate financial dealing or even corruption in how Detroit’s government let contracts. As a Republican reformer, he was voted into the mayor’s office in 1890 and then reelected for three more times for two year terms. He became a national symbol for governmental reforms for several reasons. In the 1890s, Detroit was growing rapidly and people increasingly lived further and further away from where they worked. Street car lines were seen by investors as great sources of profit. Since the lines had to be imbedded in city streets, the firm needed permits from city governments. They quickly got those, laid down their tracts and contributed to the building boom and sprawl once known as the “street car suburbs.” Most of the late Nineteenth Century neighborhoods we find in Detroit today were built where they are because of the street car lines. Once they were put down, the street car firms knew that had a service no one else could provide, so they tended to increase their fares. Voters frequently complained that a license to operate street cars was a licensed to steal from the public. There was, of course, almost no alternative to using the street cars. Mayor Pingree took on Tim Johnson, the owner of street railroads in Detroit, Cleveland and other Midwestern cities. Pingree demanded that Johnson reduce his fares. Johnson refused, setting off a bitter fight. When Johnson would not back down, Pingree not only opposed letting Johnson extend his Detroit lines, but used city financing to set up an alternative municipally-owned street car system. This greatly enhanced his popularit,y but the lawyers that Johnson hired got the state courts to prohibit municipal ownership of a Detroit street car line. The Panic of 1893 was an economic crisis that truncated economic activity throughout the nation. There was no formal measurement of unemployment at that time but that rate soared as firms cut thousands of workers from their payrolls. This economic recession was different from the previous ones that racked the country such as the Panic of 1837. For the first time, a large fraction of the population lived in cities. When men and women lost jobs, they could not depend upon their own produce or their own chickens and hogs as rural people might. There was no unemployment system to help the out-of-work and certainly no Social Security benefits that might let the elderly poor survive. Detroit, because of its specialization in manufacturing goods, was probably much more devastated by this recession than other cities. Mayor Pingree decided that the city should put the unemployed to work building schools, parks and other facilities—an early stimulus strategy that proved very popular with the voters. He also knew that there were many open spaces in Detroit and he strongly encouraged people to grow as much food as they could. Although his “potato patch,” program was the target of many jokes, it was effective in reducing the misery of Detroit’s unemployed residents and it increased his popularity. In brief, at a time when most mayors and civic officials were seen as using their positions to help themselves and their friends get rich at the taxpayer expense, Mayor Pingree was viewed as championing a reform of municipal government and as a mayor who would stand up to those who owned the utilities. Pingree also called for a reform of taxation. I believe that he wanted to derive all tax revenues from a tax on the value of land. He did not achieve this radical reform of taxation. In 1897, Hazen Pingree was the successful Republican candidate for governor of Michigan. He won and intended to serve as both mayor of Detroit and governor of Michigan until his term as mayor expired. The State Supreme Court put the kibosh on that idea and so he took the job in Lansing. In 1901, Pingree and his family went on a safari to Africa. He apparently contracted an illness and died in London on his return trip to Michigan. 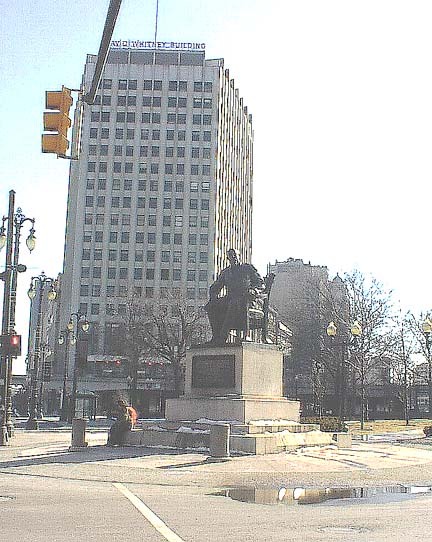 Given the very high esteem Michigan residents had for him, it is not surprising that this impressive statue of him was erected in Grand Circus Park shortly after his early death. The sculptor, Rudolph Schwarz, was born in Austria in 1840. In 1897, he migrated to Indianapolis, Indiana to help a German sculptor complete a Civil War memorial in that city. Schwarz remained in Indiana where he designed a number of war memorial sculptures and taught art. So far as I know, this is his only work in Michigan. Book: Melvin Holli, Reform in Detroit: Hazen S. Pingree and Urban Politics. New York: Oxford University Press, 1968. City of Detroit Designated Historic District: This monument is within the Grand Circus Park Historic District.